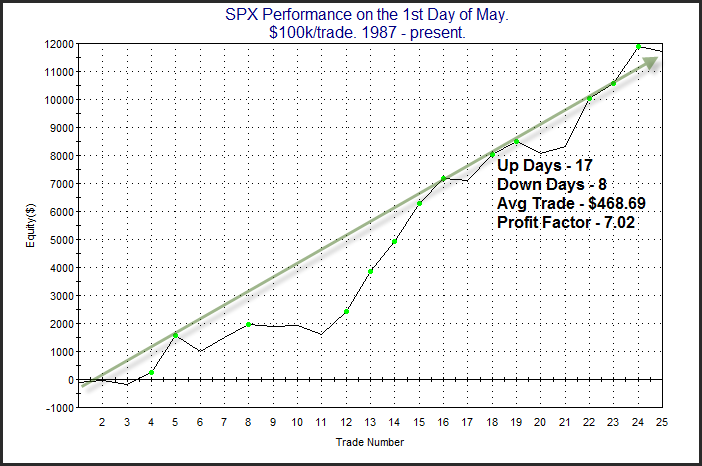 In the 8/24/11 blog I looked at the impact of breadth on Follow Through Days (FTD). To compare breadth across market regimes, instead of using absolute breadth readings I use relative breadth readings. The study below uses the 1-yr Up Issues % Rank. This reading compares breadth versus all other days for the last year. Despite the strong price action, Tuesday only ranked in the 84th percentile breadth-wise. All stats are updated. As you can see, there is no discernible short-term impact from the FTD. The stat at the bottom is interesting, and suggests the bears may even have a slight intermediate-term edge when FTDs don’t include strong breadth participation. And for those that may be curious, the success rate rises to 52% when breadth comes in above the 95th percentile. 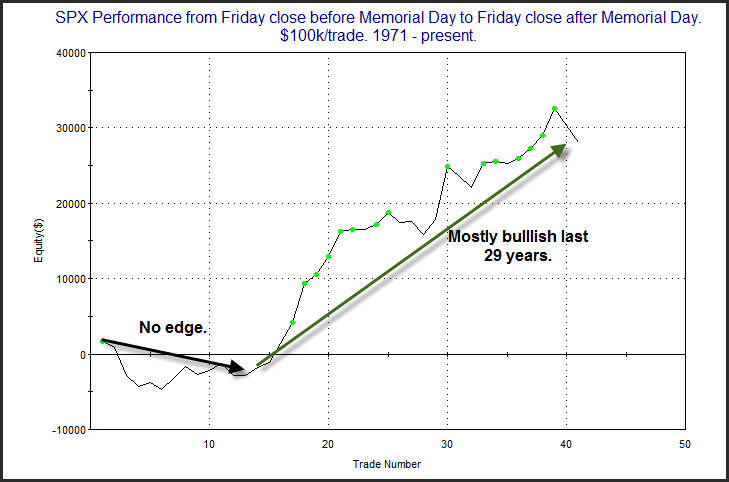 The week of Memorial Day has shown some bullish seasonal tendencies over the years. This can be seen in the chart below. CBI Returns to 1. Now What? After spiking up to 11 last Friday the Quantifiable Edges Capitulative Breadth Indicator (CBI) dropped back down to 1 on Thursday’s close. (I noted this on Twitter http://twitter.com/qerob ) I’ve discussed for years how buying selloffs when the CBI reaches 10 or higher and then selling when it returns to 3 or lower is a reasonable approach to taking advantage of the CBI. In Monday’s blog I listed all 26 instances and the results of taking this approach. We now have one more to add to the list. Buying on the spike to 11 on Friday the 18th and exiting the trade at yesterday’s close would have meant about a 2% gain. So now that the CBI is back to neutral, what might traders want to be on the lookout for? One obvious answer is an IBD Follow Through Day (FTD). There are many, many FTD studies on the blog, and if one arrives I will be sure to note and discuss it. The rally near the end of the day Wednesday saw broad participation and aggressive buying. At one point the NYSE TICK spiked over 1500. It actually registered its highest intraday high since the end of August. I saw comments suggesting the very high TICK reading after a test of the lows was a good sign for the bulls. So I evaluated this concept. 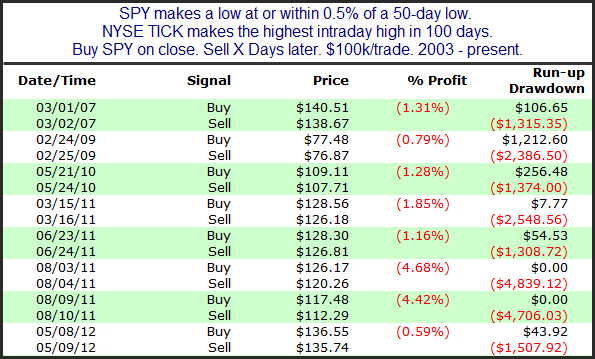 I formulated a test to simply seek out other instances where SPY probed or tested a new 50-day low while the NYSE TICK hit its highest intraday level in at least 100 days. The 1-day returns were the most interesting. I have listed all instances below. The consistent and sizable weakness the next day has been very impressive. On average, the day following the extreme TICK near a market low has lost just over 2%. The average drawdown (2.5%) has been over 12 times the size of the average run-up (0.2%). It sure doesn’t look like the frantic intraday buying and high TICK is a positive. CBI Crosses 10 - How Bad Can The Selloff Get From Here? Notable about Friday’s action is that the selling caused the Quantifiable Edges Capitulative Breadth Indicator (CBI) to rise from 7 to 11. We now have the 10+ CBI reading that I have discussed and written so much about over the years. Over the weekend I thought I would examine individual instances of CBI readings of 10+ and look to answer the question “How bad could it get?” The table below again considers the approach of buying the SPX when the CBI hits 10 or higher and then selling when it moves back down to 3 or less. 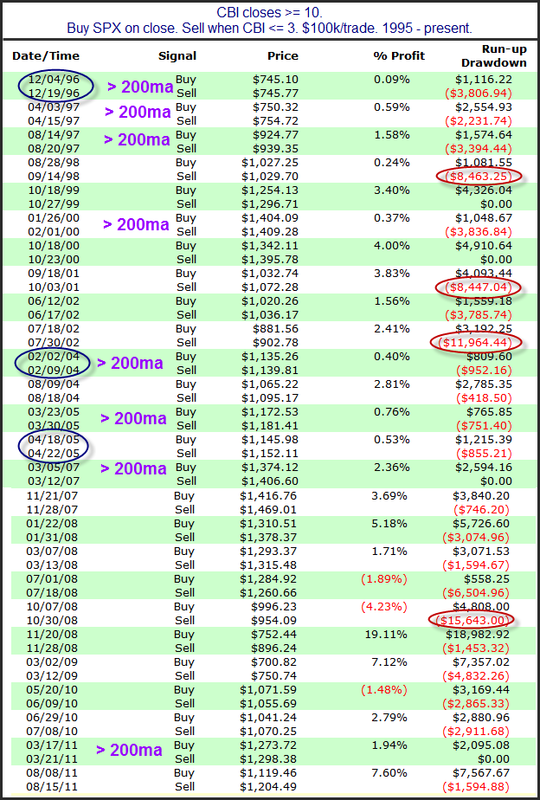 Before we look at drawdowns you’ll note I circled 3 dates in blue. The current selloff has been a slow-motion meltdown. There hasn’t yet been a down day of 2% or more. The blue circles mark the only other 3 instances where the CBI reached 10 without a single-day decline of 2%+ in the last 10 days. We can’t deduce much from just 3 instances but it is notable how unusual the current selloff has been. 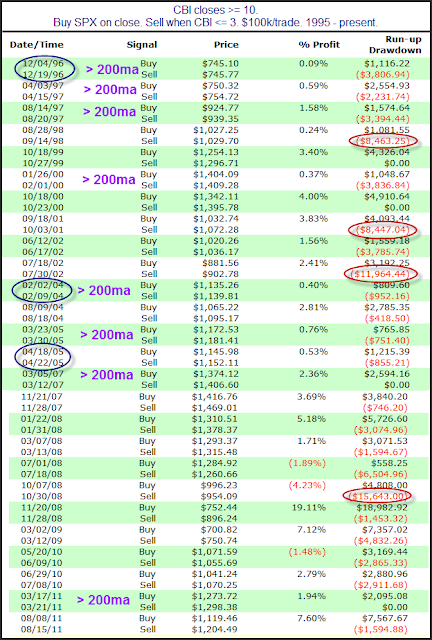 I’ve marked all the other instances that occurred over the 200ma on the table. As you can see, the worst declines were less than 4% from the entry point. But perhaps you don’t feel these volatility or trend filters are appropriate. In that case you should consider all the other listed instances. I’ve circled in red above the 4 worst selloffs that occurred after the CBI hit 10. They were in 1998, 2001, 2002, and 2008. All of them were historically notable selloffs. They ranged between 8% and 15.64%. And while 3 of the 4 resulted in profitable trades, an 8%-15% drawdown over a few days can be pretty painful to sit through. I looked at them all closely in last night’s subscriber letter. (Click here for a free trial.) One thing I will note is that they all made their selloff low within 3 days of the CBI crossing 10. CBI on Rise. A Breakdown of Different Readings. The Quantifiable Edges Capitulative Breadth Index (CBI) closed at 7 on Thursday. For years I have viewed 7 and 10 as key CBI levels. A CBI of 7 has generally suggested a decent upside edge, while 10 or higher has suggested a strong upside edge. The CBI will only typically rise to levels of 7 or higher during sharp market pullbacks. I decided tonight to examine results following CBI readings between 7 and 10. But tonight for the first time I am breaking out results by whether the market is above or below its long-term moving average. First let's look at times, unlike the present, when the SPX was trading below its 200ma. The stats table below looks at returns assuming you bought the close on a day where the CBI registered at least a certain number. The exit signal occurred when the CBI dropped back down to 3 or below. Results here are strong across the board. Most traders would agree that it might make sense to wait for a CBI reading of 10 or higher, rather than enter early with a CBI of 7. While there are 42% less trades, 85% of the net profits are still realized by waiting for a reading of 10, rather than using 7 or higher as an entry signal. Now let's look at times like the present, where the CBI is spiking but the market is still above its 200ma. There are few things to note here. First the average trade is much lower than you see when the market is < 200ma. This is primarily because volatility is generally higher during bear markets. What's interesting is that there has been the exact same number of instances where the CBI reached seven or higher (31), but while the CBI has reached ten 18 different times when below the 200ma, it has only managed it 8 times above the 200ma. And with the average trade being almost identical regardless of whether you use 7, 8, 9, or 10, in the long run you would have made nearly 4x as much by using 7 as your trigger rather than 10. Regardless of whether the market has closed up or down, SPY has consistently closed near the lower end of its range over the last 5 days. 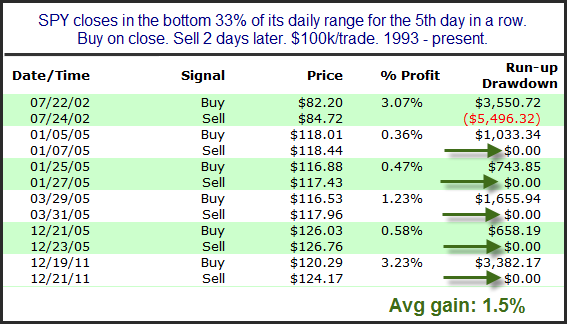 Below is a list of all the instances where SPY closed in the bottom third of its daily range for five days in a row, and their returns over the next two days. What I find most remarkable about this study is not the fact that all 6 instances closed higher 2 days later, but that the last 5 never saw any drawdown over the next 2 days. That means they gapped up on day 1 and went 2 days without filling. On Monday the SPY closed at a 50-day low for the 1st time since the beginning of October – just over 150 trading days ago. Not only is it at an intermediate-term low, it is strongly oversold on a short-term basis based on several measures. Many traders are therefore looking for a bounce. Strong bounces from intermediate-term lows are often initiated by a large move overnight. Big gaps in overnight action will often create strong emotion at the open and can help to spark a bottom (at least a temporary bottom). To illustrate my point the study below looks at 3 scenarios. 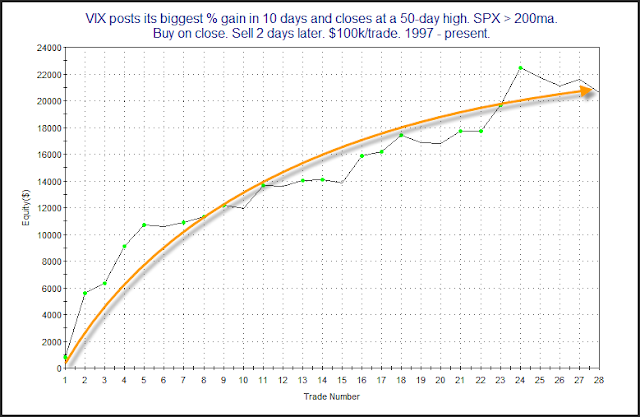 Each scenario shows results of buying at the open the day after a 50-day closing low and selling at the close. The only filter I use to distinguish is the size of the opening gap. Let’s first look at small (or non-existent) gaps. Results here appear weakly bearish. This isn’t very surprising considering the market is obviously downtrending if it is making 50-day lows. But now let’s see what happens when SPY gaps down over 1%. Much more volatility among both winners and losers. More often than not the emotion has at least temporarily washed out the selling and the net results have been solid intraday gains. Now let’s look at results if the market gaps up over 1%. Here again we seen bulls have won out a little more often than bears. Like the last scenario the big gap serves to increase volatility in both winners and losers, and the net results show strong intraday gains for the bulls. In this case the upside edge is not due to a “washout” of selling, but more likely it is panic buying as those that were short overnight are afraid that the market is going to run away from them - so they rush to cover, creating what is often referred to as a short-covering rally. In either case, when trading at new lows, the emotion generated by a large opening gap can often ignite a flurry of price movement that is not seen following small overnight moves. More often, but not to an overwhelming degree, that flurry of price movement will result in strong intraday gains. This is why I become more interested in buying emotional opens following new lows than I do when the market opens flat. The VIX closed at its highest level since January on Monday. In the past when it has closed at a high level on a strong move there has been a tendency for the SPX to bounce over the next 1-2 days. This can be seen in the study below. The numbers appear compelling. Below is a profit curve using a 2-day hold. Not quite as compelling with the recent fade, but perhaps still worth taking into consideration. Of course this does not change yesterday’s observation that market conditions are abnormal and risks are elevated. Despite reaching a short-term oversold condition several days ago, the market has failed to mount any kind of substantial bounce. I looked at this a number of ways over the weekend and in the subscriber letter last night. One study I conducted looked at other times the SPY was above the 200ma and after registering a sub-5 RSI(2) it failed to get above 30 for 5 straight days. (The sub-5 RSI(2) 1st occurred on 5/4 and the 5 straight days under 30 commenced on 5/11.) This is the 1st time ever. It has managed to do it 3 times when the SPY was below its 200ma, and I have listed those below. The bottom line is that we are in uncharted territory. Quantitative analysis is great at helping us to identify high-percentage situations. Those are times when you often want to bet big. But when we go beyond “oversold and likely to bounce” to “oversold and acting in a way never seen before”, it suggests caution to me. We are in an abnormal market and keeping bets smaller is often a good idea under abnormal conditions. I have seen some evidence over the last few days suggesting a bounce is likely. But it hasn’t been overwhelming and there is one thing that has been notably absent – a rise in the CBI. The Quantifiable Edges Capitulative Breadth Indicator (CBI) measures capitualtive selling among S&P 100 stocks. I have written many posts on it over the years, which can be found using the CBI label on the right hand side of the blog. The next paragraph is a brief overview for those that are unfamiliar. To construct the CBI I simply count the number of active triggers among S&P 100 stocks for my Catapult system. The Catapult System was designed to identify stocks that are undergoing capitualtive selling and are likely to see a strong reversal. When a broad number of stocks are undergoing capitulative selling it suggests the market as a whole is undergoing capitulation and the likelihood of a market reversal becomes stronger. I have generally looked for a CBI of 10 or greater to signify a strong likelihood of a bounce. Of course there are many successful pullbacks that never see a spike in the CBI. But when selling gets intense I prefer to have CBI confirmation before aggressively allocating. As of now, it appears the CBI would only go from 0 to 1 even with the additional 1%+ selloff the market is enduring today. Again, there is some evidence suggesting a bounce right now, but the CBI is unusually weak. I will be sure to alert readers if we do get a spike in the coming days. Detailed CBI description and discussion of Catapult results from 2008 – 2010. The new Catapult Exit Designer code and 2011 results. And of course, all Catapult signals and CBI tracking are inclusive in Quantifiable Edges Gold Subscriptions and have been since the subscription began in 2008. 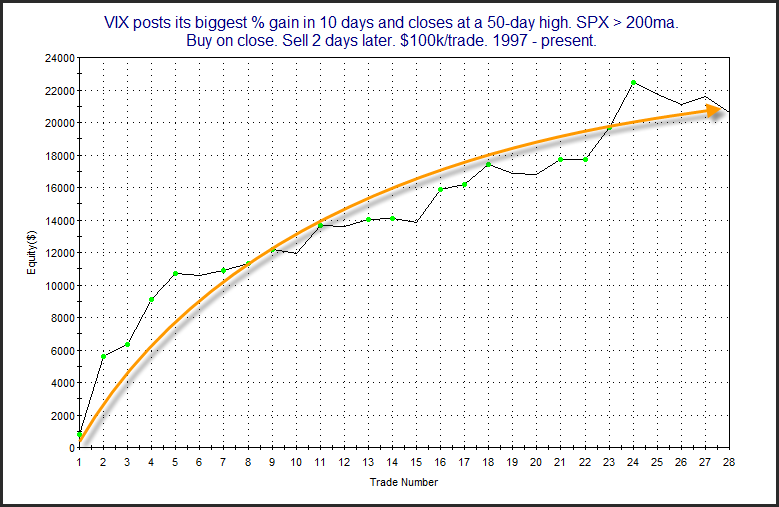 Yesterday I showed the strong seasonal tendency of the SPX on the 1st trading day of May. One reader wrote and asked whether the day-1 strength exhibits a tendency to follow through or to reverse. I took a quick look and was surprised at how consistent the results were. You may find them in the table below. Of the 17 instances that rose on the first day in May since 1987, 13 of them closed lower 4 days later. 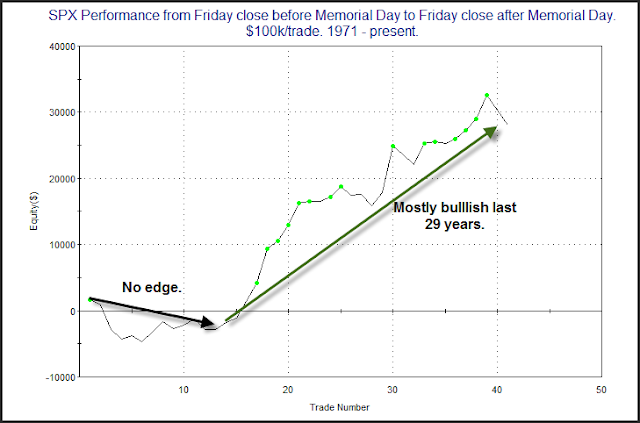 I’ve discussed many times before how the 1st trading day of the month tends to be seasonally bullish. May has been one of the strongest months, both based on total return and % profitable. In 2010 I published a chart that showed May 1 returns over time. I’ve updated that chart below and included some stats. Even with last year being a slight loss the 1st day of May has demonstrated a seasonally bullish tendency over the years.